It's Alvina's birthday! To celebrate the birthday of my oldest friend (oldest meaning longest friendship, not oldest as in age), I sent her what I've long suspected are the key to a children's book lover's happiness. CUPCAKES! 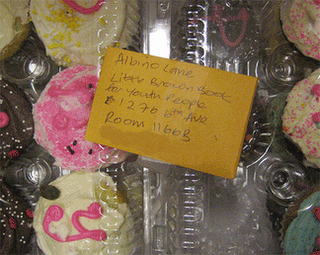 "Could you put letters on the cupcakes," I ask, "I'd like it to spell out 'Happy Birthday, Alvina." "Yes," the man said, "Happy Birthday, Albina." "No," I say, "Alvina--like Alvin with an 'A'"
"With a 'V'" I say. "Yes, yes," he says, "With a 'B'"
"No, 'V'" I say, "V like vote." "Yes," he says, "B, like boat." "No," I say, "V like very." "Yes," he says, "B like berry." "V like venom?" I offer. "Oh, ok," he says, "I have it 'V' like backroom." At this point, I decide to take his word for it and trust that a successful transaction has occurred. However, later, I must admit defeat. For instead of being sent to 'Alvina Ling' the cupcakes are sent to 'Albino Lane.' Happy Birthday, Albino!